Kim came up with a brilliant theme for this episode that will get you all fired up to start making budget gifts to give during the Christmas season. We all know that this time of year can be expensive if others expectations are high, so cut your costs by making your own personalised gifts. We talk about some of the great homemade presents that friends have given over the years. It was because they were homemade that we remember them many years later, unlike all the crap that we used to buy and be littered under the Christmas Tree before our sustainable living journey began. Thoughtful, simple, yet memorable gifts, made with love. Who would want for anything nicer? We also mention that the show will be more regular and that we are already planning our Christmas Special. If anyone has any duet suggestions for our song, then send them in via email, the more the merrier. Whatever the song is, it will be fun to produce. It will be our budget gift to you! Lactose intolerant? Crave a good yoghurt without getting bloated, or just want a break from dairy? Here’s something that you may want to try. This post will teach you how to make soy yoghurt easily and cost effectively. We decided to try something other than ordinary dairy yoghurt, partly because our daughter Amy is lactose intolerant. We wanted to serve up something she could eat as a snack when she visited because she used to love eating my home-made cheese, and partly because I wanted to know what I was talking about because we stocked a non-dairy yoghurt culture at Little Green Workshops. 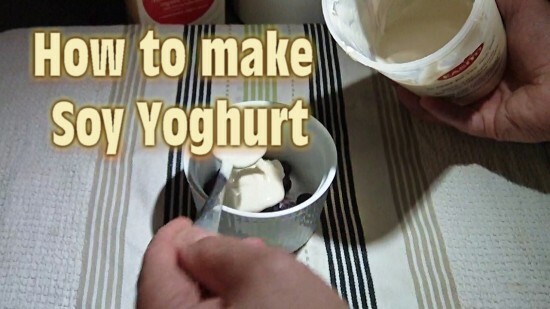 So after a bit of testing and research, I developed an easy method of how to make soy yoghurt. Here is how I made this non-dairy yoghurt. By the way, Amy loves this yoghurt! A yoghurt maker. If you have an EasiYo, then that is perfect. A stainless steel pot, or glass jug if planning to heat the milk in a microwave. a yoghurt maker or EasiYo. 1 Litre of “Soy” milk. I used one made from organic soybeans. 1 dose of Non-Dairy Yoghurt Starter Culture, approx 1/64th teaspoon (a heaped drop). Pour your soy milk into a 2 litre saucepan and clip on your thermometer. Add your starter culture to the soy milk and mix well to ensure the culture is evenly distributed. Mix the sugar into soy milk and warm to 40°C. Pour your milk into the yoghurt maker, or EasiYo pot. Maintain the milk mixture between 37° and 43° C (98F to 110F) for 12 hours, or even longer for a thicker soy yoghurt. Refrigerate your yoghurt for a couple of hours then serve whichever way you fancy! You can serve it with berries, or stir in some homemade jam, or even some honey! You’ve probably heard of the term that a picture, or in this case a video, is worth a thousand words, so to help you all out to create successful soy yoghurt, I have created a video tutorial. We love this soy yoghurt on our muesli for breakfast and for dessert with berries. If you follow these instructions, you can enjoy the creamiest soy yoghurt around, and best of all, you can make it yourself easily and for a lot less money than you can buy it in the supermarket! Not wanting to sound salesy, Kim and I do have all the necessary equipment and ingredients in our Yoghurt Making section of our online store. If you already have an EasiYo or can beg, borrow, or steal one, then you just slashed your yoghurt costs! How many of you have tried making soy yoghurt? Did you use a different method? 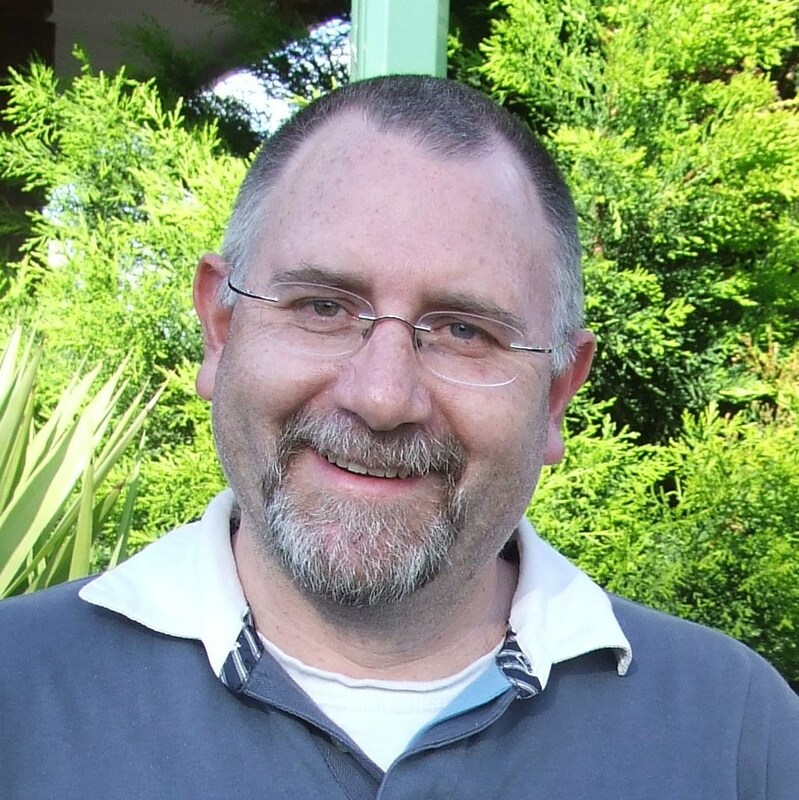 Unless you are blessed with fertile soil in your neck of the woods, I have found that most Australian suburban developments are built in areas that have been stripped of precious topsoil and left barren or covered over with a thick blanket of builders rubble. 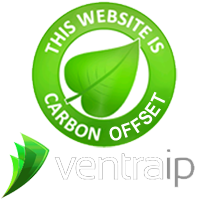 The remaining substrate may be sand or clay, each having its own issues. Sand doesn’t hold water very long and lacks essential nutrients, and clay either dries as hard as concrete or is so dense when it’s wet that tender roots find it difficult to penetrate. 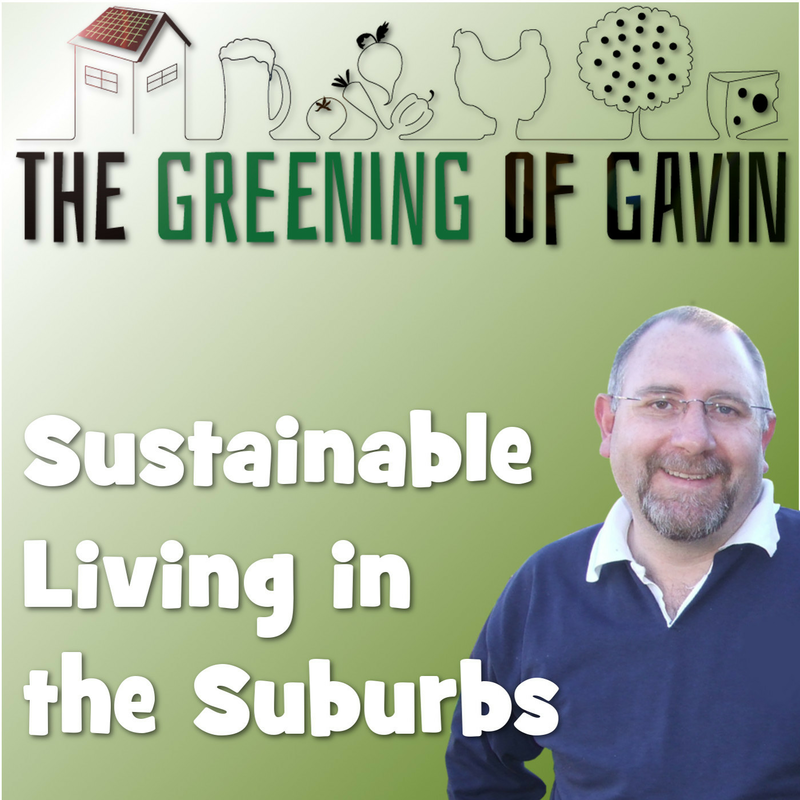 So what is the suburban gardener to do? Well for those lacking space, we’ve already covered growing in tight spaces, but what about all of you who have a decent amount of open area in which to plant? Well the long-term solution would be to build up the soil with a mountain of organic matter in the form of compost to increase or decrease the water retention capacity of your soil, but there is an easier way to start growing quickly. The easiest way to get food on the table when you have poor soil is to build up your soil by growing food in raised beds. The good thing is that there are many cost-effective ways to do this, but in the end the simple fact is that you have to import good soil or compost in to get started. Over the years, you can make your own soil using the efforts of your chickens, or uses as much garden waste as possible to turn into humus from compost and at the same time adding essential nutrients back into your growing areas. 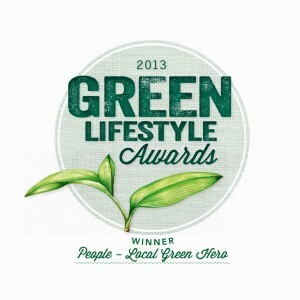 So here are a few ideas that I have used or seen to create amazingly fertile garden beds. The majority of raised garden beds around my home are made from reclaimed or sustainably harvested red gum hardwood. This type of building material is long-lasting and rots very slowly over time. The only drawback is that if you live in a termite prone area, then they serve as food for them and last half as long. When building your beds, make sure that they are wide enough to reach across, and if you are prone to back issues, then build them up using reclaimed brick first to add some height. I built ours 2.4 x 1.2 x .5 metres in size. I find it a practical growing space for a couple of varieties of vegetable. 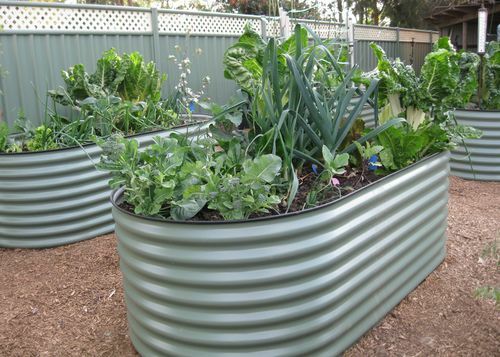 Many of the newer raised garden beds that you can purchase are made from corrugated iron or Colorbond. Most are an elliptical shape to remove any sharp edges and stand about 80 – 100 cm tall. These are ideal for people with mobility problems and can be maintained without too much bending. They are easy to construct and usually only require a couple of spanners and are long-lasting. As these beds are so tall, they are easy to set up as wicking beds, however if not uses as wicking beds, you may need to throw in about 30 cm (1 ft) of rubble into the bottom to save the requirement to add so much topsoil or compost. 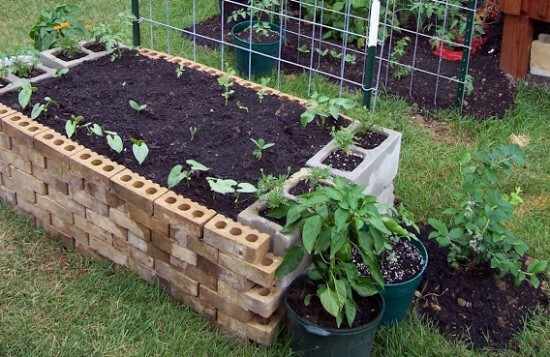 With a little extra wood fastened around all the edges, wooden shipping pallets can be utilised as a raised garden bed. You may think that they are not tall enough, but you will be surprised to know that most vegetables only put down roots that are less than 20 cm in length. 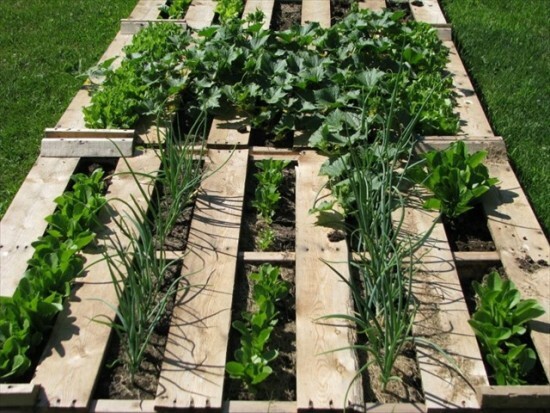 This makes a wooden pallet ideal when the spaces are filled with salad greens, tomato plants, or even sweet corn. Root vegetables are not suited for this shallow type of raised bed. 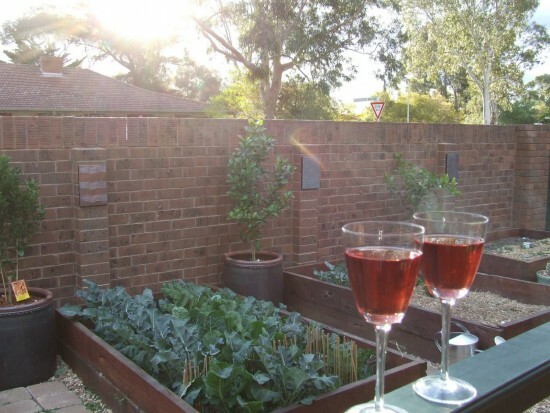 If you have or can get your hands on old brick, large or small, then you can put them to good use as the boundary of your garden bed. You may have to fasten them using a bit of mortar before adding the soil, however if you have large besa bricks or cinder blocks, then these, when filled with dirt, will support the soil in your raised garden beds without issue. The great thing about brick is that you can form just about any shaped bed you like to accommodate the space you have unlike wood which would need multiple cuts to achieve the same outcome. Reclaimed brick raised garden bed. Source; Creative Commons. 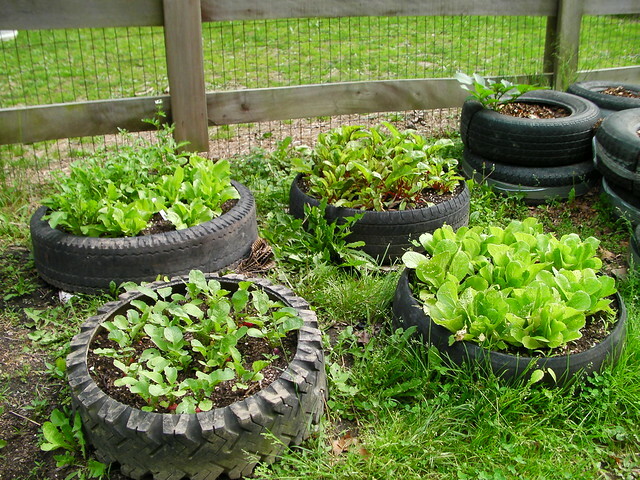 Large truck or tractor tyres made a good raised garden bed, as they hold a lot of soil. You don’t need any construction skills to quickly get this type of garden bed started. When I have used tyres, I just cut off the rim with a jigsaw to provide more growing space. You will need to drill a large hole first so as to insert your jigsaw blade to start off. Most crops can be grown safely in tyres as long as the edible part of the vegetable is above the ground. This excludes potatoes as research has suggested that growing potatoes in tyres risks chemical contamination of the edible tubers. 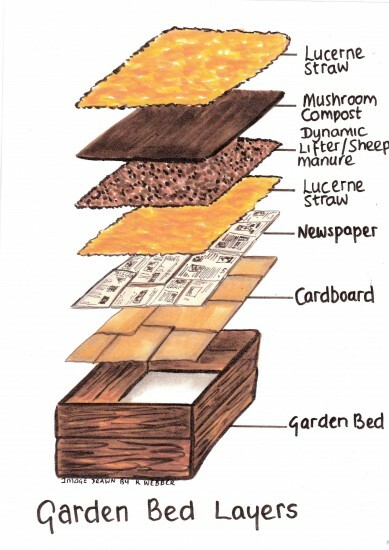 Once your bed is constructed with whatever material you choose, the next step is to build up the growing medium. Here is how we initially built up each bed then added more home-made compost on top over the years. I filled the beds in the following order. The first layer was a thick cover of cardboard and newspaper about 5 sheets deep. This ground cover was to kill the weeds, grass and provide food for the earthworms. Next was a 10 cm layer of either Lucerne hay or pea straw. I chose pea straw and the added bonus was a quick crop of field peas! The third layer was a 2 cm layer of Dynamic Lifter (you can use well-rotted sheep or chicken manure). For the four beds I finished off an entire 25Kg bag of very smelly Dynamic Lifter. I then covered the manure with another 5 cm layer of pea straw and then a layer 20 cm thick of mushroom compost garden mix. It was a 50-50 mix of mushroom compost and a loam type soil that was filled with organic matter and very suitable for the purpose of growing vegetables. Lastly, I topped it off with a 5cm layer of sugar cane mulch, to help conserve water by stopping evaporation. Over time the organic matter rots down and build up the soil. The vegetables thrive in the first couple of years, but you have to add more compost and manure to keep the nutrients flowing. So there are a few ways you can grow veggies in your own suburban food bowl even if you have the poorest soil in the country! 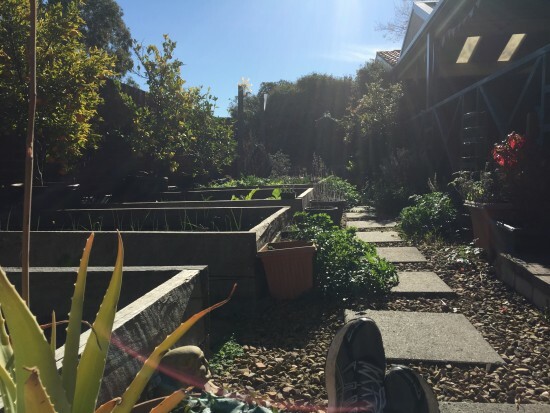 There should be no obstacles for growing food and making your backyard a suburban food bowl.